Maryeve has visual arts degree and trained as a Circus Arts Instructor at the National Circus School of Montreal (Canada). She works as an instructor of social circus at Cirque du Monde from 2008 to 2015. Now she works on her artistic projects . She is also the manager the pole fitness studio La Polkadot where she teaches pole fitness, handstand and flexibility. She won Hooping Idol 3 in 2013. She teach hoop and perform her act in many international event like Dubaï Street Festival, Festa del fuoco di stromboli, German hoop Convention, Austrian Hoop Convention, Hoopcamps. Jorden Moir is the 2016 IJA Championships Silver medalist and . he's competed in the prestigious Crique De Demain competition in France. Highly respected in the world of footbag and juggling, he has devoted himself to creating a unique act unlike any other. Dawn Dreams is a contemporary circus artist specializing in the mesmerizing manipulation of crystal balls. She has been exploring character work with Ponchiko style clowning techniques, narrative through contemporary dance and the exploration of various object manipulation styles including toss juggling, fabric flag dancing and hoop manipulation. Having just returned from a 2 year training session in France, she is grounding her work in European techniques and ideas from the contemporary juggling scene. Bekka Rose is a female juggler and professional circus artist. As a recent graduate of École de cirque de Québec, her specialties are club and ring juggling. Bekka Rose was born in Vancouver, BC and first introduced to circus at age 7. In 2009, after exploring the juggling scene in Europe, she completed a 5-month specialized juggling course at The University of Dance and Circus in Stockholm. Then in 2013, back in Canada, she graduated from the professional circus program at L'École de cirque de Québec in Quebec City. Now living in Montreal, she is one half of the juggling and partner acrobatics duo, Hand Me Down Circus. Jordan Cross, 17 years old, was born in Kingston, Ontario! Self taught he has been juggling for 3 and has performed in a several juggling festivals including The RIT Spring Juggle-In, the University of Waterloo Juggling Festival and of course the Limestone City Juggling Festival! Evelyn Coulson is an international circus artist from New Zealand performing mostly on all things of the circular variety - aerial hoop and hula hoop. She has performed both here in Canada and in New Zealand at variety of festivals and stage productions. Despite the warnings of Icarus, Sebastian Ferlo isn’t afraid to fly too close to the sun. A dedicated diabolo artist from a family tradition of circus arts, he has performance in his blood. We’re happy to have this skilled RIT juggling club member on stage! Dominique Rabideau makes some delicious pastry. She also heats up the stage when she performs. An avid juggle for years now, she has dedicated countless hours toward the development of her performance and is happy to join us. You'll be certain to enjoy what she has cooked up for us. Jeff Peden began his performing career in 1987. Since then he's won numerous juggling awards, served as President of the Rochester Juggling Club, taught juggling at R.I.T. (1999-present) and acted as a circus skills consultant and show producer. His training includes intensive workshops with professionals from the San Francisco Circus School, Cirque Du Soleil, and Ringling Clown College as well as degrees in History and Education. We are the jugglers of the Queen’s and Kingston Jugglers’ Clubs We are Queen’s students and Kingstonians, young and old, expert jugglers and absolute beginners. We love everything about juggling and circus, from Slackline and Unicycle to Flow arts and Poi. Follow our Fest activities here or better yet come and visit us in Kingston. 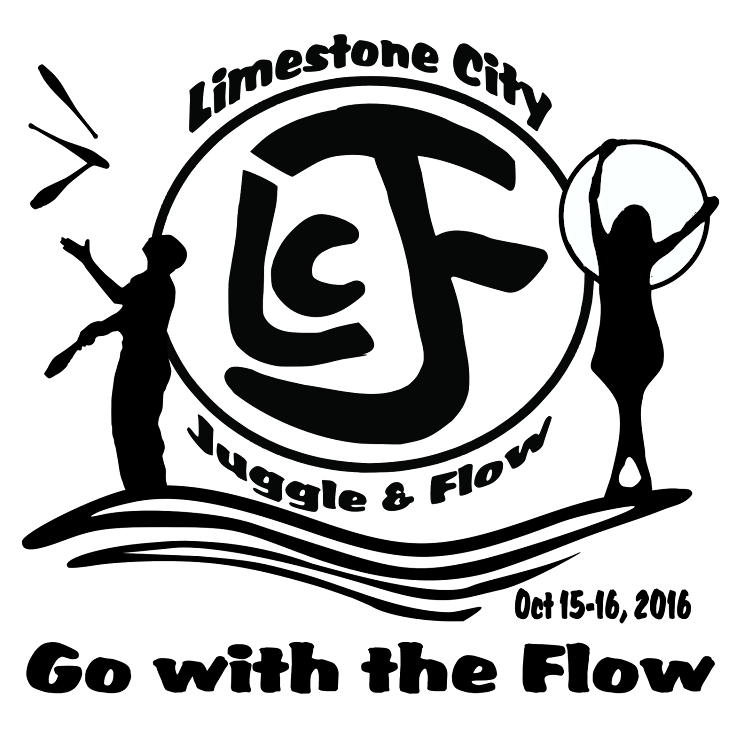 Come to the Juggle and Flow party in Kingston!